Vander Bush Powersports needed a look to give people a feel for their organization. As well the owner also wanted to see what marketing possibilities were out there, so he came to Cybrac. 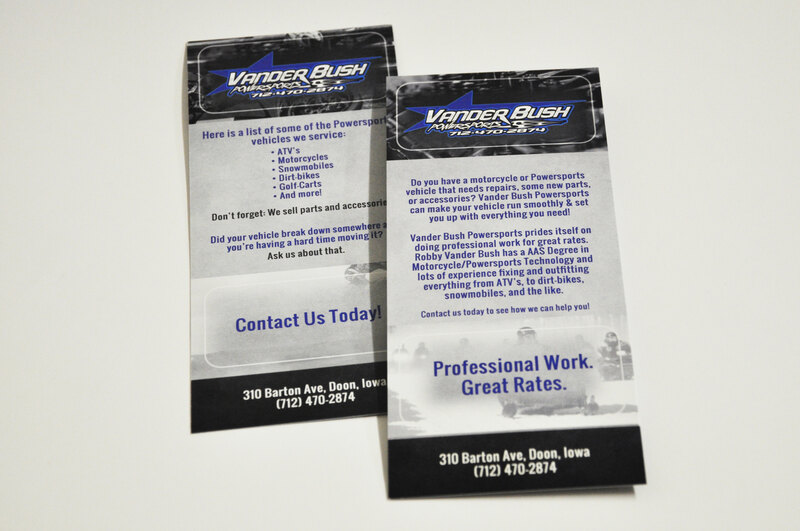 We created a look for the business, and flyers to show off of the Vander Bush Powersports skills & services. We’ve enjoyed working with home businesses & seeing the entrepreneurial spirit thrive. Vander Bush Powersports needed a look to give people a feel for their organization. As well the owner also wanted to see what marketing possibilities were out there, so he came to Cybrac. We created a look for the business, and flyers to show off of the Vander Bush Powersports skills & services. We’ve enjoyed working with home businesses & seeing the entrepreneurial spirit thrive. Vander Bush Powersports needed a look to give people a feel for their organization. As well the owner also wanted to see what marketing possibilities were out there, so he came to Cybrac. We created a look for the business, and flyers to show off of the Vander Bush Powersports skills & services. We’ve enjoyed working with home businesses & seeing the entrepreneurial spirit thrive. Vander Bush Powersports needed a look to give people a feel for their organization. As well the owner also wanted to see what marketing possibilities were out there, so he came to Cybrac. We created a look for the business, and flyers to show off of the Vander Bush Powersports skills & services. We’ve enjoyed working with home businesses & seeing the entrepreneurial spirit thrive.